Thanks to some really cool new technology, it is now easier than ever (and FREE) to setup your portal to use your own domain name. In order to make this work, we utilize a dynamic certificate authority called Let&apos;s Encrypt. With the Let&apos;s Encrypt CA, we are able to create the SSL certificate on the fly. These certificates have a 90-day life cycle. But not to worry, your certificate will auto-renew at least 30 days prior to the expiration. Here are the steps to setup your domain to work with GoToMyAccounts. Choose a URL for your portal. Some commonly used portal addresses are portal.yourdomain.com, accounts.yourdomain.com, or billing.yourdomain.com (replace yourdomain.com with your own domain name). But you can choose whatever you like. 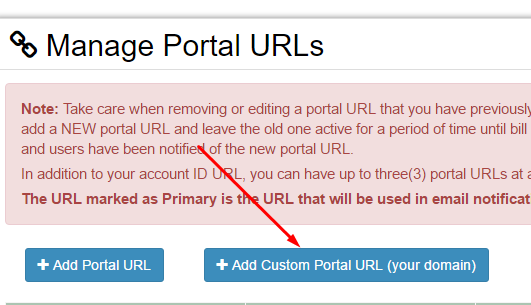 You must be the primary (super user) on your portal account to modify the portal URL. Login as the super user and in the side menu, look under "Accounts", and then "Manage Account", and then finally "Manage Portal URLs". In addition to your account ID URL, you can have up to three(3) portal URLs. Only ONE can be the primary URL. The primary URL is the address that will appear in email links, etc. It is recommended that you choose a primary URL and then try to stick to that address so as not to confuse your users/customers. 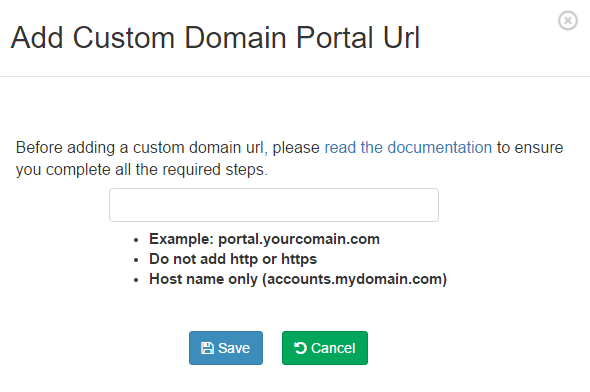 Click the "Add Custom Portal URL (your domain)" button. You MUST have control over this domain in order to use it. That is, you must have the ability to modify DNS records. You will see why in a moment. Once you have added the new portal address, it will not yet be set as the primary. DO NOT set this address as the primary until you have confirmed that all the steps are completed. During creation of the new address, we will display the host name you will be using for the CNAME record you will create in your domain&apos;s DNS management interface. You need to login to your domain management interface and add the CNAME (alias) record for your domain. For example, if you registered your domain with GoDaddy, you will login to your GoDaddy account and add the record. Some common how-to links for this step are listed below. It&apos;s relatively easy to do, but if you get stuck, you can ask a web expert for help or open a support ticket. Name.com - adding a cname record. Tip: Do not try to open or navigate to your new portal address until AFTER you have created the CNAME record. Why? All DNS records have what is called a TTL (time to live). Depending on your DNS provider, this can be an hour, but sometimes several hours. If you navigate to your new portal address BEFORE adding the cname record, your DNS server will cache that name lookup for the full TTL time period. That means you won&apos;t be able to test or use your new address until the TTL expires. And who wants to wait, right? So make sure to wait until everything is completed before trying a test. Once you can confirm that you have set the cname record, you can proceed to testing it out. The first time you load the new address in your browser, it will hit our servers and they will begin creating the SSL certificate for your custom address. On the first hit, this takes a few extra seconds to do all the confirmation and creation processing. If the creation of the certificate fails, you will see an error message. In most cases, it just means you need to wait a couple hours and try again. But be sure also that you have entered the portal address exactly the way you created it. And of course also make sure the DNS cname record is valid. If you have waited and tried this step again, please open a support ticket with us so we can assist you. If you have followed all the steps correctly, your new portal address should display the login screen and you can go ahead and login. Important final step! : Now that you have confirmed the new portal address works, you need to go set the new URL as the primary. So go back to the "Manage Portal URLs" screen mentioned in step 2\. Make your new custom URL the primary. That&apos;s it! You&apos;re done!. If you previously had customers logging into an old address, you might want to send your customers an email or announcement containing the new address of your portal.